OUR PRICE: $31.37 - Join Rewards Get $3 Dance Dollars On This Item! Bloch's leather "Elastosplit X" has elastic attachments that contour the natural lines of the foot. The symmetrical design provides support and security. Neoprene inserts allow room for the metatarsals joints when going through demi-pointe. The shoe molds to the sole of the foot, hugging the arch and enhancing the line of the foot. Criss-cross elastics attached at heel. We love this shoe. It seems to fit almost any type of foot well. We will definitely be ordering more! Whenever I use ballet slippers in class I wear these. I find they turn well and the whole split arch thing really allows you to point through your foot. I wouldn't wear these on stage just because of how space age-y they tend to look. I found that these ran larger than most Blochs. 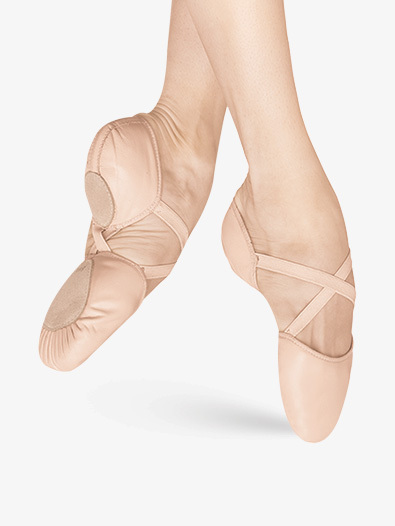 I ordered a six, what I always get in my Bloch Dansoft but they were always a bit larger and the elastic X tends to stretch out a lot over time. However, these shoes are very pretty and they have lasted me a long time with no holes. I had to get these for my daughter's ballet class. No store around sells them, so I was told to look on line. I was a little worried because I wasn't sure of what size to get. We figured out the sizes and the shoes fit perfect. They have them in wide which is what we needed. My daughter has wore them around for two days. They came really quick too. Just in time for her ballet class. My daughter has a very narrow foot, and we initially tried these because they came in a smaller size and an A width. She is on her 3rd year in these and loves them. They fit well and are durable, with the added benefit of allowing for a full year's growth via the elastic under the bottom. I really like these shoes!!! They are very comfortable and easy to move in! I'm a size 9.5 in Women's shoes and I ordered a 7C. They are a little big but they form to your foot. I would suggest ordering a shoe 3 sizes smaller then your street shoe. I dance on a daily basis and was wearing out my ballet shoes so quickly. My dance instructor recommended these shoes to my and I LOVE them! They last much longer then my other ballet shoes did and I love how they compliment the foots arch very nicely. Overall a great buy and worth every penny! These are amazing! I've had the same pair for two years, and I could probably get another year out of them, but they're really dirty and ready to be replaced. I will definitely buy another pair of them! During the two years, I wore them at least 3 hours a week. Other pairs of ballet shoes only last for less than a year for me, and I've always only had leather ones. They feel a little weird when you put them on for the first time, because you're not used to that design of shoe yet, but then after that they are the most amazing thing you've ever danced in! These are the most comfortable ballet slippers I have ever worn. The leather is super soft. The elastic arch is a fantastic idea. I don't know why anyone would wear any other slipper. Buy these, best shoe ever. So totally awesome! These are not only soft and comfy,they are also more comfy than even going barefoot. They felt soft and wonderful through my tights.Everyone should own a pair. Bought these last year for ballet, and ended up wearing them for my solo too. They are great for turning, I was doing solid 9-10 pirouettes at competition last year. I just bought more for my ballet classes this year and probably will be buying more for competition season! I recently purchased these shoes. Many girls at my dance studio have them and adore them. I now understand why! They are extremely flexible and show a beautiful point. They also seem to last awhile for the other dancers at my studio, but only time will tell for me! I am a 9 in dressy shoes, and got a 7.5, which fits well, though a 7 probably would have been better. I use them in ballet classes and also in lyrical and contemporary. They are also a nice leather. They are light enough where they look like canvas, but don't get dirty as easily. They also come with extra elastic, in case one would like to sew it on for extra security but I've had no problem with the shoes coming off. I encourage you to purchase these, they are quite affordable and can be used for many styles. Enjoy them! These shoes make your feet look incredible! They are so easy to pointe, tendu, pirouette, just everything. But the best thing is that it makes your arch look fantastic!! I would recommend them for any and everybody! I am a size 7.5 in street and I ordered a 5B and they are PERFECT! I love these slippers! I have wide feet and bunions that make other slippers uncomfortable. It took 2-3 hours of dancing before they were broken in and fit well. They do not hurt, like other slippers. I can concentrate on dancing and not on adjusting my shoes. I love this shoe! It's very comfortable for everything! I've had mine for about 2-3 years now and the only problem is the soles on the inside.. but I just ignore it. After a while, they tend to stink though. I have had the same pair of ballet shoes for the past year and a half, and they are the Elastoplit Leather Ballet Slipper. I wear them five days a week and I absolutely love them! They make the line of the leg look so much longer than the normal ballet shoe, and really fit my feet well. The only thing to know is that it is hard to adapt to them at first. There is no arch support so it was uncomfortable to get used to them. But after a while they are really great! The letters "B", "C", and "D" refer to width. A "B" is narrow, a "C" is medium, and a "D" is wide. If you do not typically have to buy narrow or wide street shoes we recommend going with a "C" width.